Need a comfortable spot to place your foot? 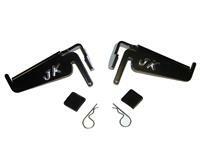 Skid Row Offroad's Foot Pegs install in the lower door hinge on both the driver and passenger side of your Jeep. They're set at a comfortable angle and have rubber bumpers to prevent damaging your Jeep's paint. No tools are required to install the Foot Pegs, although you may need a wrench to remove your doors. Theres nothing like the freedom of Jeeping with the doors off. But when you want to kick back and enjoy the drive, it can be uncomfortable for your foot, even on the doorsill. Thats where the all new Smittybilt Jeep Foot Pegs come in! Made of quality 1/8" CNC cut steel and coated in our signature series matte black textured powdercoat, these foot pegs are both durable and stylish. Enjoy doors-off driving in style and comfort with the Smittybilt Foot Pegs. Note: Always check your local laws and regulations before driving with the doors off. There's nothing like the freedom of Jeeping with the doors off. But when you want to kick back and enjoy the drive, it can be uncomfortable for your foot, even on the doorsill. That's where the all new Smittybilt Jeep Foot Pegs come in! Made of quality 1/8" CNC cut steel and coated in our signature series matte black textured powdercoat, these foot pegs are both durable and stylish. Enjoy doors-off driving in style and comfort with the Smittybilt Foor Pegs. Note: Always check your local laws and regulations before driving with the doors off.